We have a lot of games on our website and those are just the main games, when you add in the other games there’s a lot to get your head around. Should it be Storm the Castle or The Hunger Games and what do they even involve? What are the games? What will I be doing? The game we list on our website is the main game, we will play a number of other games around that one. 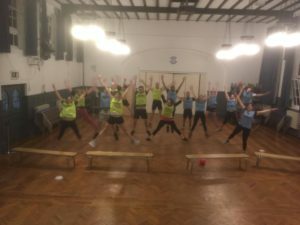 In one session we tend to play 10-12 different games, we try to make sure that we cover a wide variety of different skills and use a range of different equipment. The instructor will always play the main game listed but they will switch up the other games that they choose for each session to keep it interesting. You can expect that each game will be different, the games are designed to make you run around, so wear your sports gear. The games are always team based and will resemble remixed team games or playground games. If you have any specific questions do email us, but don’t worry about the specifics of the game before showing up. Am I fit enough to join in? 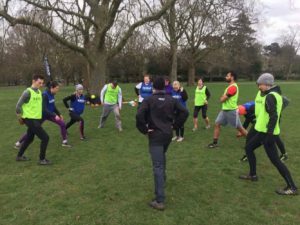 Rabble is designed to help you get fit, so you don’t need to be a professional athlete before showing up, just come as you are and get involved. There is absolutely no need to worry about whether you’re complete beginner with either games and/or fitness. 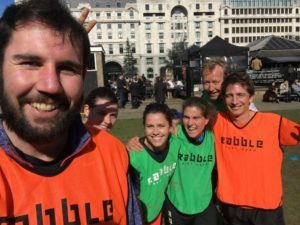 Everyone starts here and as one player put it “You might not be fit when you arrive, you will be very soon!” At Rabble we never tell you want to do, we simply give you the rules of the game, and you can do what you like. Maybe your strategy is to take your time and be more stealthy, maybe it’s to run around madly, maybe there’s no strategy and you just go with the flow. It’s up to you, it’s your game and you can take what you want from it. But you are welcome to play with any level of fitness. I don’t know the rules of the game? Because we mix up our games frequently, we always explain all the rules before we play any of the games. You might not grab all the rules in one hit, but don’t be afraid to ask someone on your team or the instructor. And if you get it wrong, nobody cares – we’ve all been there! After a few games you’ll be on top of the format and it’ll all be making sense in no time. 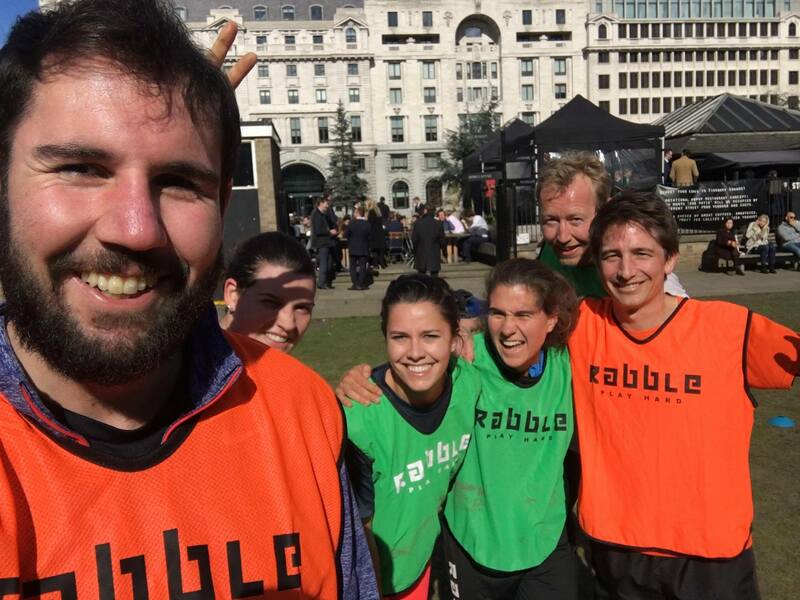 At Rabble we are all here to have fun and to play some games. We play games because they are enjoyable, and they allow you to get creative and give you a real purpose for movement. It’s a game so yeah there’s a winner and a loser but we play 10-12 games in each session and so nobody’s tracking your personal score. We play because we love playing the game, not because we are going to parade our victories every week. Does it matter which game I come along too? No. Each game will be different and we play different games in each one but think of it like an opportunity to improve your skills in different areas, ball games will help improve your co-ordination and balance, games like stag stalker will help improve your endurance, chase games like bulldogs will help with speed etc. But all of our games are open to anybody new or old timer and combined they will work on different fitness principles. Will I get injured or rugby tackled? All of our games are non-contact (yes even British Bulldogs & The Hunger Games). There’s no tackling or wrestling allowed, however high fives are approved. You have a similar low level of risk with our games as with any physical activity. Do I need to start with the Newbie session? You can start at whichever game you like, you are very welcome and any of our sessions. However once a month we have a newbie session, just for those of you that want to be absolutely sure that you won’t be the only new face. However you can come to any game that suits you. Essentially the big secret is that it really doesn’t matter which game you choose to come along to, just choose one that suits you. 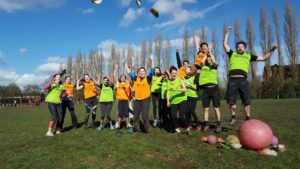 All we can guarantee is that you’ll have fun and that each one you go to will have a similar inclusive feel but totally different games! Come and join us at a session soon!